Tip-Enhanced Raman Spectroscopy (TERS) is developing into a powerful technique for the characterization of bio-molecules at the nanoscale level. It facilitates chemical imaging on the scale of single molecules, extending well established techniques such as surface enhanced Raman Spectroscopy (SERS) and Raman mapping. Work by Dr Thomas Schmid and co-workers from Prof. Renato Zenobi’s group at the Dept of Chemistry and Biosciences, ETH Zurich, demonstrates the use of TERS for label-free chemical characterization of nanostructures in biological specimens . The biofilm system chosen for the investigation was based on calcium alginate fibres. TERS provides detailed chemical information at very high spatial resolutions (<50 nm), with one key advantage being label-free characterization. A TERS system essentially brings togetherscanning probe, microscopy and Spectroscopy technologies. 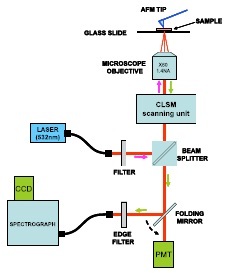 Figure 1: Schematic of the set-up used by Schmid and co-workers for acquisition of TERS spectra. Prof Zenobi’s group set out to test the feasibility of using TERS to carry out label-free chemical characterization of nanostructures within biofilms. Label-free techniques remove the challenges of labeling samples using dyes or tags. Calcium alginate fibres were considered a good representative model for the extracellular polysacharrides of biofilms. A schematic of the setup used is shown in figure 1. It essentially consisted of three main subsystems – an Atomic Force Microscope - AFM (Veeco Instruments), an inverted confocal laser scanning microscope – CLSM (Fluoview, Olympus), and a Raman Spectroscopy system consisting of a HoloSpec F/1.8i spectrograph (Kaiser Optical Systems) and an iDus 420 CCD camera (Andor Technology). The excitation laser (532 nm) was delivered via a single mode fibre. The CLSM unit delivered the light into the microscope, where it was focused onto the sample with an oil immersion objective (60x and NA=1.4). The scattered Raman signal was collected by the same objective and passed back through the CLSM unit and a beam splitter to be focused into a multimode fibre, which delivered the signal to the entrance port of the spectrograph. An edge filter placed in front of the spectrograph was used to reject the Rayleigh scattered light from entering the spectrograph. The sample could be scanned in 2D by control of the x-y stage upon which the sample was mounted. A folding mirror in the system allowed for rapid switching between confocal imaging and spectral acquisitions modes. Illustrative data is shown in figure 2. An AFM image is on the left and background corrected TERS spectra on the right. The latter were produced when the tip was a few nanometers from the surface (nearfield). In contrast, when the tip was the order of microns from the surface (far-field), it had no effect and no spectral signature was evident even with very long exposures (10 mins). Schmid and coworkers identified characteristic marker bands for the macromolecules studied. They observed shifts in the Raman band positions for these complex macromolecules, in contrast to observations for the corresponding bulk samples of the same material which showed no shifts. It also contrasts with less complex molecules where there was no observed shift in the bands for the TERS spectra. They attributed the shifting in large part to the influence of chemical enhancement (CE) processes occurring at the tip interface. In the first application of TERS on alginates, the group successfully demonstrated the collection of weak Raman spectra at high spatial resolutions from extracellular polymeric substances (EPS) without the need for labeling. Such materials include polysaccharides, nucleic acids and proteins. This work represents a significant step forward in the development of the TERS technique as a reliable, accessible, and robust analytic technique for many applications in the life science, medical and materials fields. Low photon signals place increased demands on the sensitivity of the detector used and the collection efficiency of the optical system. Only high performance cameras can give the required signal to noise ratios to make such measurements possible. The ideal system will be capable of single photon detection - an area where Electron Multiplying (EM) technology is of a definite benefit. High sensitivity facilitates the use of lower excitation fluences; this minimizes thermal effects and damage to the sample.